Picard Of The Pops - Alexander Courage | Warped Factor - Words in the Key of Geek. 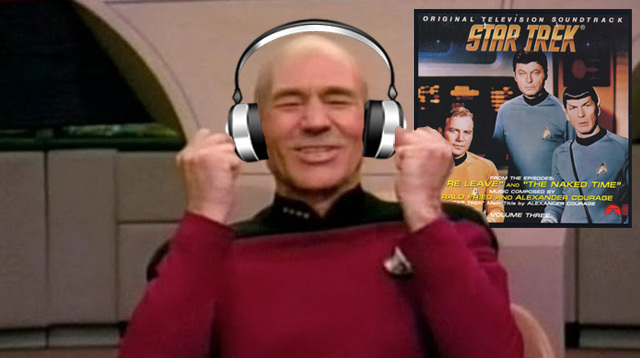 Christopher Morley begins a new feature looking at the work of the many composers who have scored Star Trek. He had actually enjoyed an extensive career in film well before accepting the job of music master aboard the Starship Enterprise, starting with MGM. Obtaining a degree from the Eastman School of Music in 1941, he served with the US Air Force as a bandleader during the Second World War. Somehow he also found time to compose the music for several CBS radio plays during this period - Adventures Of Sam Spade Detective, Broadway Is My Beat, Hollywood Soundstage and Romance. Cinema soon came calling, and with it a post as orchestrator/arranger. Several well-known films from the early 1950s feature his work in this regard for the big screen - Show Boat, The Band Wagon, Gigi and Seven Brides For Seven Brothers. Star Trek fell on his doorstep after Jerry Goldsmith turned down creator Gene Roddenberry's original offer of work on the fledgling series (though he would return in a sense with work for five of the original Trek films beginning with 1979's The Motion Picture). "I think it's just marvelous malarkey. So you write some marvelous malarkey music that goes with it." The New York Times offered a succinct summation of the ingredients that made that theme so iconic even after the man who wrote it departed following just four episodes of the series it became so indelibly identified with! "A bold fanfare for brass, followed by a lyrical theme for French horn. Over the music are the wordless strains of a high soprano and a whooshing sound (vocalized by Mr. Courage), which accompanies the Starship Enterprise as it passes across the screen. The net effect is an exquisite combination of pomp and cheesiness." "If you were to strip away everything, bit by bit, in order of importance, the last thing you would be holding in your hands would be the sheet music for the opening fanfare." We can also add pop to that pomp, Courage naming Beyond The Blue Horizon by Richard Whiting as an influence on his most recognised work. The ultimately scrapped pilot episode, The Cage used flute & organ as well as an orchestra, with the "oo-oo-oo-oo-oo-oo" supplied by soprano Loulie Jean Norman. Her vocal and the instruments were placed equally in the mix, the man who put them together hoping to achieve a "what is that that I'm hearing?" effect. His employer was having none of it though, & promptly altered the track to accentuate the vocal. "Space, the final frontier. These have been the voyages of the Space Shuttle Discovery, Her 30 year mission: To seek out new science. To build new outposts. To bring nations together on the final frontier. To boldly go, and do, what no spacecraft has done before." Where No Man Has Gone Before was of course the title of the second episode of the original series, scored by Courage. The Man Trap and The Naked Time rounding off his contributions to Series One. Two more scores would follow for Series Three in The Enterprise Incident and Plato's Stepchildren. "I'm saying the same thing with a little different twist on it. Once you get caught up in the creative process, something inside takes over, and your subconscious just does it for you." He was also more favourably disposed towards science fiction! "When you stop and think about it, space is a very romantic thought. It is, to me, like the Old West, we’re up in the universe. It’s about discovery and new life ... it’s really the basic premise of Star Trek." Nevertheless we must be grateful for small mercies, Mr Courage deserving of his place in the captain's chair of composition here.